OK, most of us know how to carve a pumpkin, right? We may use a Sharpie marker to sketch out our pattern, cut the top off and dig out the innards. We then proceed to carve out three triangles, one for the nose and two for the eyes. We might go totally wild and make some jagged teeth when we carve out the mouth. We may even decide to make the pumpkin frown for a change. Heck, when I was young I thought carving crescent shaped eyes was a big deal! I was practicing the child-mild version of pumpkin carving all along. There are those who really go to extremes when it comes to pumpkin carving. These pumpkin carving artists are capable of producing some of the most stunningly beautiful carvings that you will ever set your eyes on. These people take their craft very seriously. They create awesome jack-o-lanterns for Halloween! Extreme pumpkin carving artists will employ a myriad of tools to produce their final masterpiece. Artists have been known to use an assortment of chisels, as well as power tools. Other tools have been used such as chainsaws (for those massive, on steroids type of pumpkins) to lasers. I’m serious-lasers. I’ve also heard of pumpkins being carved with high power rifles, although I wouldn’t recommend you try that at home. You have got to admit the laser carving was unique! However, not everyone has a laser out in the garage or basement that they can play with. So how do you become an extreme pumpkin carver? You can start with one of those simple pumpkin carving kits that are available around Halloween. These come with easy to use patterns and tools. If you have woodworking chisels you can use them. Chisels or sculpting tools are mainly used for the type of pumpkin carving that removes portions of the pumpkin’s outer layers. This allows the candle inside the pumpkin to cast a glow through the skin. I have never tried an extreme pumpkin carving. I do enjoy wood carving, so who knows? It does seem like a natural progression. Maybe this will be the year I give it a try! 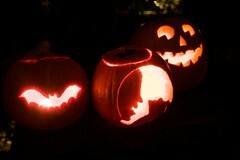 Wow-I didn’t realize there were so many different ways to carve pumpkins! Thank yoyu for this excellent resource! I’m so glad you found it helpful, Margaret! These pumpkins looks great! I think I would love to attempt some of this. I procrastinated last year and I didn’t get any carved until the day of Halloween. If I am going to do any extreme carving this year, I will have to get a jump stat for sure! The extreme carving is a riot, Norman. Most of them do take some extra time and planning. Send me a photo or video if you decide to do any. I would enjoy seeing them. It’s truly amazing how people come up with different, crazy ways to carve a pumpkin! I know what you mean, Sandra. I really got a kick out of the one using the industrial laser-lol!